"Take a walk down memory lane with a 60th Birthday party!" Turning 60 is another Milestone Birthday that should be given respect, and celebrated in a way that makes the guest of honour feel respected and cherished! Have a guest book for guests to write a birthday wish. This also doubles as a big Birthday card. Take the time to make a slide show. Classy, and tasteful pictures will be appreciated. Show their life and accomplishments. Family photos, vacations, houses and career pictures work best. Start by choosing a theme for your party. See our Adult Party page for lots of theme ideas. Make your menu to match your theme or hire a local caterer to take care of all the arrangements. Be sure to send out your 60th party invitations in lots of time to let your guests know of this joyous celebration! If you're having a Surprise Party, be sure to let everyone know it's a surprise! No 60th party is complete without decorations! You can make your own Personal Banner or a 60th Birthday Caution Tape to hang at your party. 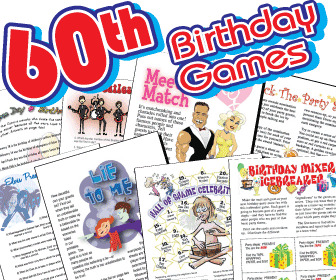 60th Birthday Printable Party Games! For more fun at your party, try some of our tasteful Adult party games.